QS's Diary: What is Gunite? I found a item called "Gunite structure" in a Drawing for a swimming pool. Gunite structure is for the steps to get on to the pool. It also indicated as a blockwork. What is gunite? How to measure it? Shotcrete is mortar or (usually) concrete conveyed through a hose and pneumatically projected at high velocity onto a surface. Shotcrete is today an all-inclusive term that describes spraying concrete or mortar with either a dry or wet mix process. However, it may also sometimes be used to distinguish from gunite as a wet-mix. The greatest advantage of the wet-mix process is that larger volumes can be placed in less time. 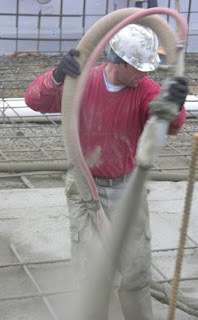 Gunite refers only to the dry-mix(mixture of Portland cement and sand ) process, in which the dry cementitious mixture is blown through a hose to the nozzle, where water is injected immediately before application. The dry mix process is useful in repair applications when it is necessary to stop frequently, as the dry material is easily discharged from the hose. According to the Drawings gunite structure is over the blockwork and mosaic tile finish is fixed to gunite using adhesive. Measured as blockwork in metre cube (m3) and billed in Blockwork bill. Measured in squre metre (m2) as backing to mosaic tile and billed in finishes bill. Measured in squre metre (m2) as mosaic tile and billed in finishes bill.